Jonathan Schreiber writes: Thought you might enjoy this bike-related street use that Justin found as we were walking from our offices to lunch in Sausalito (CA). A CHP Bike cop was getting a sandwich inside Golden Gate market. 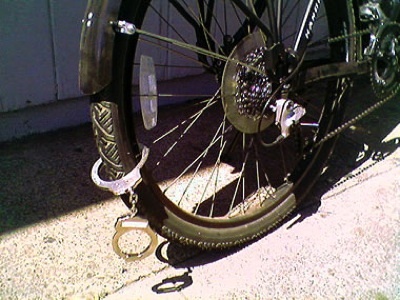 This what he used as his bike lock.